When I work for you, I have two jobs. One, solve your problems. And two, get you the compensation you deserve. When you're injured, whether it's in a car accident or other instance where you were injured through no-fault of your own, your world turns upside down. You're constantly worried about bills, physical injuries, what lies ahead and your stress levels are highly elevated. It's scary and frustrating. You want to know: -Can I afford my treatments and medical payments? Will insurance cover everything? -I can't work how will I pay my mortgage? How will I pay my bills? -Will I have to go to court? What will happen there? -What will a lawyer cost? I don't have the money to pay for one! -The insurance company knows what they're doing. I don't. How can I get a fair shake? If you're hurt, you really should talk with a personal injury lawyer in Cincinnati who knows what he's doing, who can get a fair settlement and who can answer your questions. You deserve to know what your rights are, what's next, and most importantly when this will all be over. Hiring the best injury lawyer you can in Cincinnati is how you get back on your feet and confidently plan for the future. Providing Answers and Peace of Mind My name is William B. Strubbe. As a personal injury attorney in Cincinnati, I have been representing people injured in accidents for over 30 years: union members, students, businesswomen, retired persons, truck drivers, construction workers, businessmen, farmers, waitresses, factory workers and housewives. I handle all types of personal injury & accident cases in Cincinnati and throughout Ohio, including: -Auto Accidents -Truck Accidents -Motorcycle Accidents -Dog Bites -Injuries Sustained on Unsafe Properties -Medical Malpractice or Medical Negligence -Traumatic Brain Injury -Wrongful Death -Defective Products -Workplace Injuries -And a Host Of Other Serious Injuries Caused By The Negligence of Another. When I work for you, I have two jobs. One, solve your problems. And two, get you the compensation you deserve. And as a long time Cincinnati Personal Injury Lawyer, my standard is to do this in a courteous, friendly and professional way while relying on 30 plus years of experience in getting what my clients want and need. Next Steps There are two ways you can contact me and let me start helping you: Fill out one of the questionnaire forms on this site and submit it. I will then call or email you promptly. Call me directly at 513-621-4775. There is no charge for calling me or visiting my office to discuss your situation, and no charge for submitting or discussing your questions. And while you are here, why not check out my free injury & accident legal guides. Many of your questions might be answered right here Thank you for coming here. I would like to help you. and I look forward to speaking soon. More often than not, the real issue in a personal injury case is damages what you can recover. Many times, the insurance company will concede that it is responsible for whatever injuries were caused by the other driver, but then fail to make the offer you want because it questions the extent of the damages. A good attorney has to prove not just that you had problems after the accident, but that the accident was significant enough to cause those problems. That the force of impact was so forceful, or that it was applied to your body in such a manner, that most people would expect you to be hurt. He must be able to describe your hardship in terms that other people will understand and accept. What does this mean? No answer works every time; but some things that can work include: -Making sure there is a picture of the car taken right after the accident, so the full impact of the accident is shown. Getting pictures of both cars is better. -Taking pictures of the way you look right after the accident your bruises, your bandages, your crutches, your hospital room, your splints, braces and cast. -Finding a witness who can describe the difference between the way you act now and the way you were able to move before the accident. -Obtaining your medical records, and then digging through them to see how your doctor describes your problem. -Getting the medical records from the doctor who was treating you before the accident so the insurance company can't claim that after the accident, you were only being treated for problems that pre-existed the accident. -Sometimes, getting an economist to provide a reasonable calculation of the cost of your injury to you and your family in terms of lost wages, lost healthcare and insurance benefits, increased healthcare costs, and other economic considerations. -Asking your treating doctor to write a letter saying that the accident caused your injuries and specifying a percentage of disability. -Having a video made of your life after the accident to put things in real terms. -Having an accident reconstructionist visit the scene of the accident to determine the speed of the cars at the time of impact, and analyze evidence for a claim for punitive damages. -Hiring an independent doctor to examine you and provide an opinion on what caused your injuries and their severity. You can do some of these yourself. I am probably better equipped to handle others. I tell the insurance company about your injuries effectively and with impact. Some of these things are more expensive than others; in that case I will discuss them with you before paying anyone to have them done. Some of these things are unnecessary in most cases; but your attorney should always be ready to consider them. I grew up in Cincinnati, and attended Walnut Hills High School. I was fortunate to attend the University of Oregon, where I acted in plays and wrote for the student paper. I love Oregon but this is my home. I came back here after graduation. In high school and college I worked at a lot of jobs in a direct mail advertising firm, in a sausage factory in Springdale, Ohio, and driving cabs. I worked for the Mayfield Group a firm of neurosurgeons as a "gopher" one year. I drove linens in Yellowstone Park, and worked in a trade association in Washington D.C. All of these jobs were good I performed a service, and helped support myself but they weren't what I wanted to do. Like most other lawyers, I grew up on stories of Lincoln, and Clarence Darrow great trial lawyers, who changed the country for the better. As a boy, the man I respected more than anyone was my father. He became a successful business executive, and a community leader but he had gone to law school, and worked as a lawyer when I was young. I worshipped his intelligence, his passion and his certainty and the way he could take any good idea, and use just the right words to make that idea a reality. I had known since at least junior high school that whatever else I did, I wanted to be a lawyer. In fact, I wanted to be a trial lawyer. I was accepted into U.C. Law School, where I graduated in the class of 1979. While finding work was a little easier then than it is now, it wasn't easy to find the work I wanted. I worked for the State of Ohio for a year as a hearing officer, making recommendations whether real estate agents should lose their licenses for unethical behavior. After about a year, I learned that one of my law school classmates had left his current job for work in a larger firm, and that there was an opening in the law office of Edward J. Utz. I called Mr. Utz, and he hired me. Ed Utz who died over 20 years ago was a brilliant trial lawyer. His representation of clients was ferocious. No other word applies. He was the most demanding person I ever worked for he would call me at three in the morning asking if I had done the required court filings, would yell at me for the smallest omission, and would grill me on nearly insignificant points of law and the most minute facts before I would try a case for him. I used to joke that I learned how to try cases not in the courtroom, but in his office. I am grateful to him for the standards of representation he passed on. But as you can guess, Ed had other issues. After working for him for a little over a year, I left and was hired by the law firm of Paxton and Seasongood. 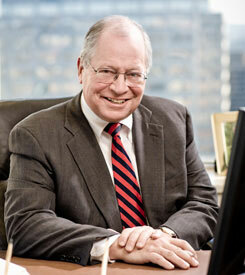 When I started there, P&S was the third largest law firm in Cincinnati, with a little over 40 lawyers. I had the opportunity to work with some of the best young lawyers in the city many of whom are my friends today and nobody ever called me at 3 AM. But I was still working for other lawyers' clients almost always for companies and was low on the totem pole. I needed to have my own clients that was the only way I would be able to do all I could for them. And the only way I could do that was to start my own firm. In 1985 I started my own law office, sharing three rooms and a secretary with a couple lawyers in downtown Cincinnati. I still have the announcement framed on my wall. My office was the one without a window. I started off representing almost anyone who needed a lawyer. My uncle had recently died, and the insurance company wouldn't pay my aunt. After I filed suit, they paid. A woman was accused by her co-worker of stealing a bracelet; the judge told me that although I had tried a great case, he thought my client was guilty but if I could get the prosecuting witness to drop charges, there would be nothing on my client's record. That worked. I took public defender cases for a couple years, representing accused people too poor to pay for a lawyer. After a few years, I realized that my favorite cases were civil lawsuits, and that I really enjoyed helping injured people recover money from insurance companies. I have represented injured people ever since, and I love it. Every person who walks through my door presents me with the challenge of doing the most I can for them, of thinking through everything about their accident, their family and their situation to get the best possible result. Need help with your profile? Click here.